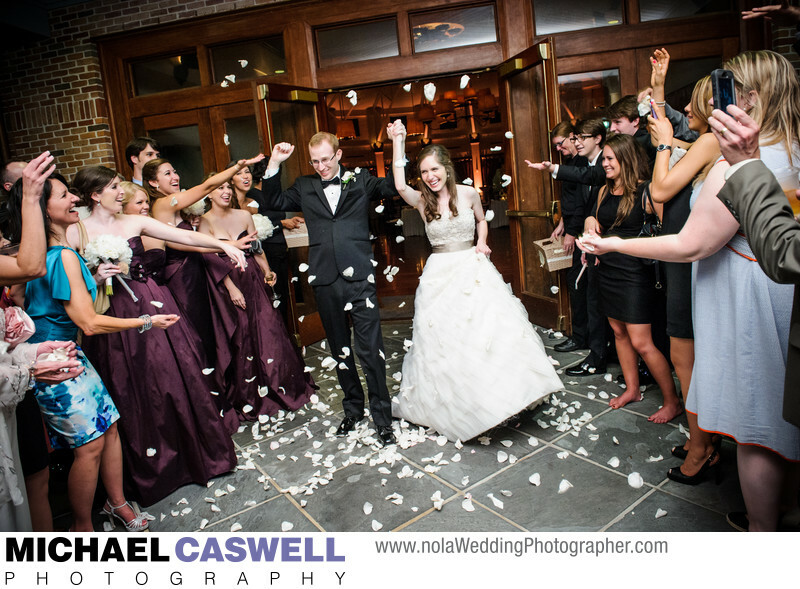 This photograph of the bride and groom being given a fabulous send-off with flower petals at the end of their reception was captured at the Audubon Tea Room, a popular and highly regarded wedding venue in uptown New Orleans. This venue is convenient to Holy Name of Jesus, where this couple's wedding ceremony had taken place, as well as several other beautiful churches in the uptown area such as Trinity Episcopal, Our Lady of Good Counsel, St. Charles Episcopal, and St. Francis of Assisi. The Tea Room also has several options for on-site ceremonies, such as the adjacent brick-paved patio and garden area, or the nearby sea lion exhibit of the Audubon Zoo. The Tea Room is very spacious, and can accommodate bigger events with high guest counts and a large band. It also benefits from an abundance of convenient on-site parking. Additionally, it's a gorgeous venue that photographs very well, with a distinctive look that is instantly recognizable in pictures, particularly wide angle shots that include the ceiling's trusswork and arc of high windows. The land that Audubon Park and the Audubon Zoo occupy was originally a working plantation, then in 1884 was the site of a World's Fair, and shortly thereafter began to be developed as a park. The present Tea Room structure was built in 1999, and serves as a much sought-after venue for weddings and other special events in the Crescent City.